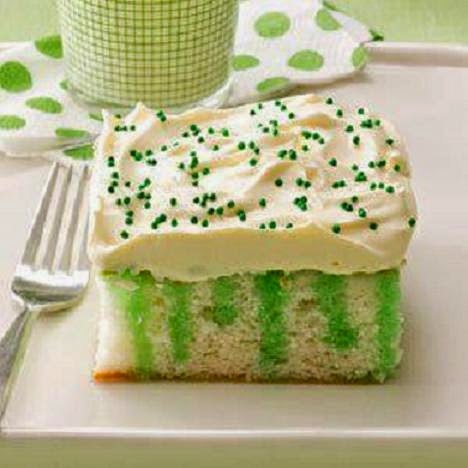 This cake uses lime Jello to become a perfect Saint Patrick's Day cake. It's been floating around Facebook for years. My notes say that it was originally from Taste of Home, though people have mentioned that they have been baking Jello cakes for decades! I have some lime Jello in the cabinet. Maybe today? 1 carton (8 ounces) frozen whipped topping, thawed, or 8 ounces of whipped cream, either whipped yourself or store-bought whipped cream. Prepare and bake cake according to package directions, using a greased 13-in. x 9-in. baking dish. Cool on a wire rack for 1 hour. With a meat fork or wooden skewer, poke holes about 2 in. apart into cooled cake. Slowly pour gelatin over cake. Cover and refrigerate. In a large bowl, whisk milk and pudding mix for 2 minutes (mixture will be thick). Spread over cake. Decorate with sprinkles. Just thinking.... This basic holiday cake recipe can be used with various combinations of Jello and/or food coloring and toppings for just about EVERY holiday. If you bake this cake, please drop a comment and tell us how it turned out!